Yummm. We sure do love these. Here’s the one thing you need to know about: Honey. Do your research. Decide when you are comfortable feeding it to your children. It is an absolute no-no before one–and so are nuts, though the latter is now up for debate thanks to some recent news from the Journal of Allergy. But because of the honey and choking hazards, children under one should not eat these. But I am not a doctor or nutritionist or anyone qualified to give advice on these topics, so talk to your doctor about nuts & honey. I’m just here to share how I make our favorite snack! Place the butter, honey, brown sugar, vanilla, and salt in a large saucepan and bring to a simmer over low-medium heat. Cook and stir for a minute, then pour in the toasted oatmeal mixture. Add the dried fruit and stir well. Pour the mixture into the prepared baking dishes. Wet your fingers and lightly press the mixture evenly into the pan, or use more parchment paper to press it down. Bake for 25 to 30 minutes, until light golden brown. (If it’s not cooked enough, they will crumble and break). Cool for at least 2 to 3 hours before cutting into squares. Enjoy! Now, you can add whatever you want to suit your taste. Our favorite concoction so far is a mix of everything above, but specifically choosing: organic oats, sliced almonds, chopped walnuts, pistachio meat, almond meal (not wheat germ), sweetened coconut, dark brown sugar, organic dried cherries & cranberries. Oh, and I added a bunch of Chia seeds, because they are so good for you. I got all my ingredients at Trader Joe’s. My kids cannot get enough of these! I make them in a giant wok on the stove because I make big batches–double the above! They stay fresh for quite a while! Soooo good. 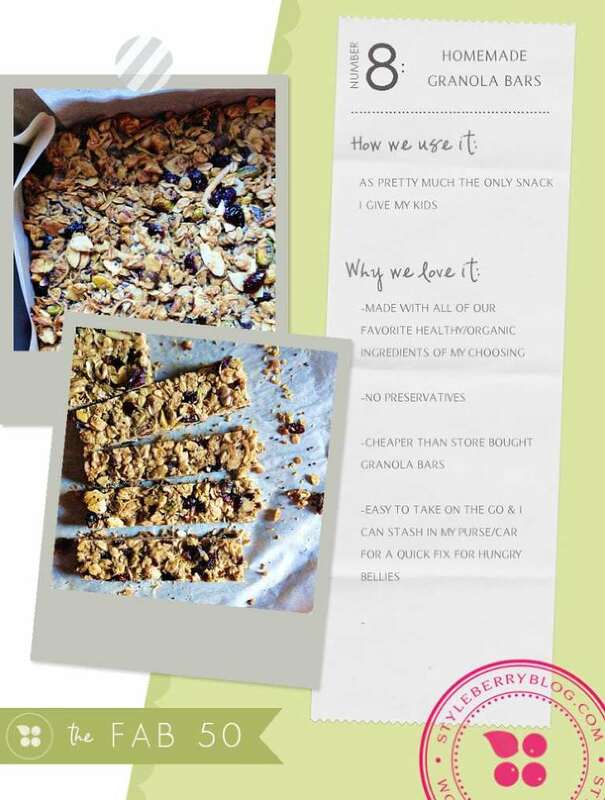 Now I need some new ideas–what do you add to your granola? Please share! Shawna, Thank you for the Granola Bars! They were beyond AMAZING! I love to have this kind of stuff. It seems tough to prepare,but will try. So delicious! I have been advised by the pediatrician to fatten up my toddler so these are perfect. Mine turned out too crumbly so they don’t really stay together as a bar. Any tips?